I love a good bargain just like the next one, but when it is an almost give away for free bargain, then I really get excited. 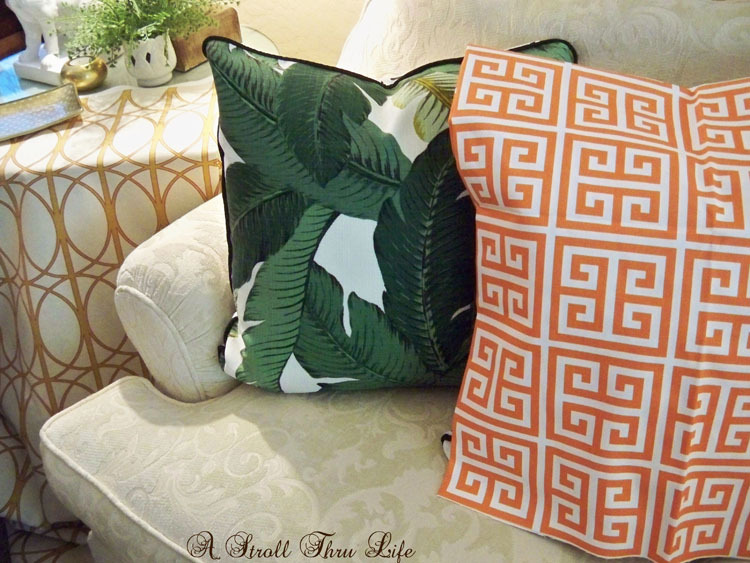 As you know if you follow along, I am a fabric nut and I love, love, love pillows. Mixing patterns and colors together is one my all time favorite things, so when the fabric is around $2 to $3.50 a yard, well, I kind of go nuts. My favorite discount fabric store - Home Fabrics is having a closeout sale and the prices are totally unreal. 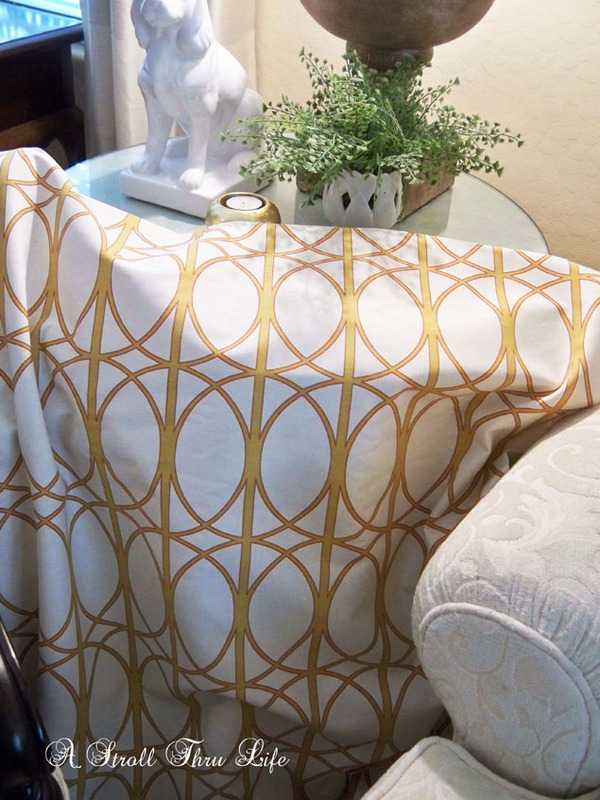 I never buy fabric with a room design in mind, I just buy what I like. You know how you buy that accessory because you love it and then find a place to display it - well - that is how I buy fabric. I buy what I like and what really speaks to me and then I know that I can create a room design around it. Now it helps that my room is basically neutral, so I'm really not limited to colors or patterns, I just gravitate towards the colors I like. So when I wandered through the fabric store the other day, of course certain fabrics just jumped out at me. I've been using a white tablecloth on this table for quite a while, so I thought changing it up a bit and using a pattern for a change might be fun. This one is going to be a great one to mix with other colors and patterns. (It was $2 yd and it takes 4 1/2 yds = $10. 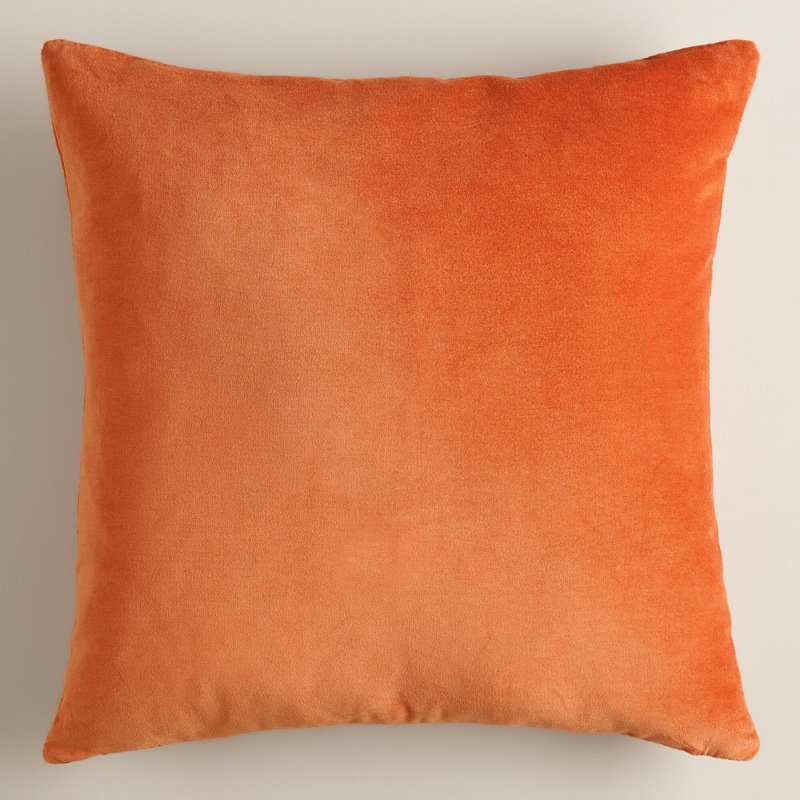 BARGAIN) It has a slight off-white background and has gold and a touch of rusty orange surrounding the trellis design. With this as my jumping off point, I started adding other fabrics. 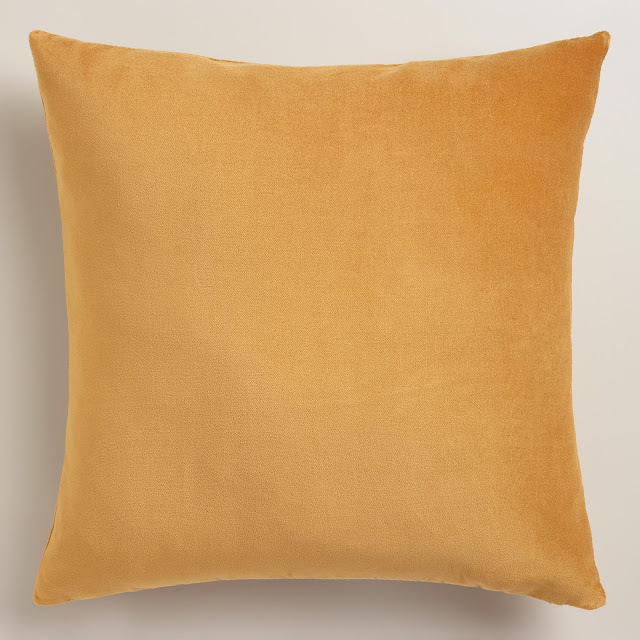 I bought this soft tangerine and cream fabric too, I think I can work this into a mix with a couple of other fabrics. ($2yd x 2 yds = $4) I like to mix several fabrics together, usually 3 to 5, just keep adding until it suits you. I go a little crazy sometimes. The Greek Key fabric I already had, and it will work well with the tablecloth too. Can you see how it is just a neutral that will go with anything. All of these work together beautifully and can mix and match in so many different ways. I also did a little bit of online BARGAIN shopping from World Market. They are having a great summer end clearance sale on pillows. Velvet pillows that are already made and at a super unreal bargain price, no way to resist these. 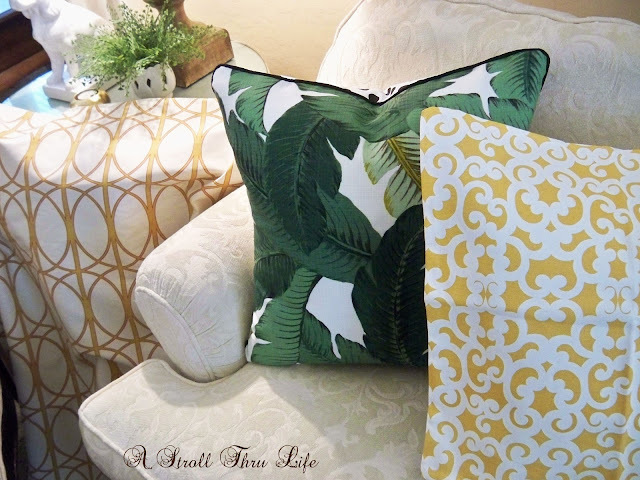 I can create several new rooms designs with the new fabrics and pillows I bought. 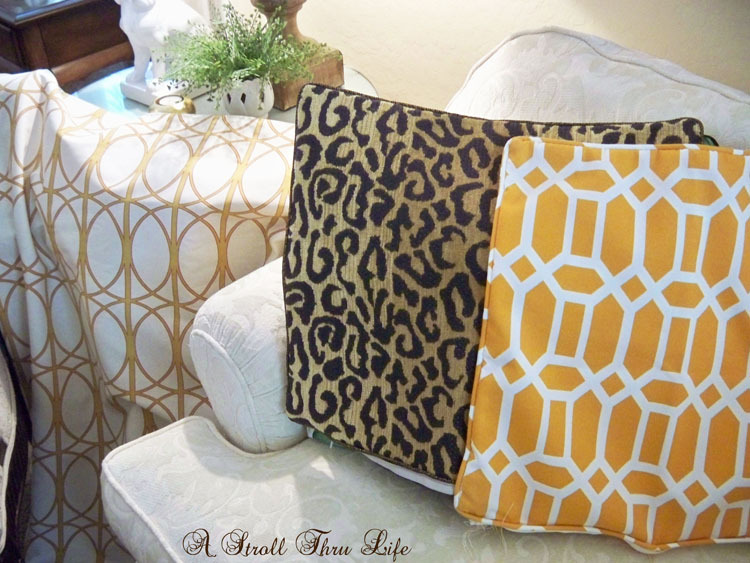 Both fabrics and pillows came to $35. That's a lot of decor for the dollar. Check back and I'll show you how to make a really easy round tablecloth. you've created some great looks there Marty! I am loving ALL the fabrics you got and all the combinations you have come up with. Every combo works beautifully. Have a great Sunday! I love those Cost Plus Pillows. So much bang for the buck! Gorgeous fabrics, Marty! You have such a great talent for choosing colors that will look pretty together! 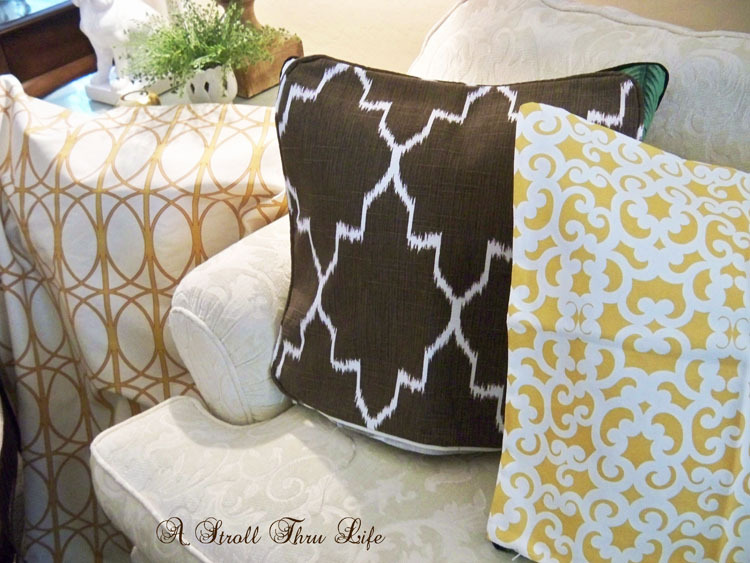 Dear friend, I adore how you harmoniously blend fabrics for your home decor!!! 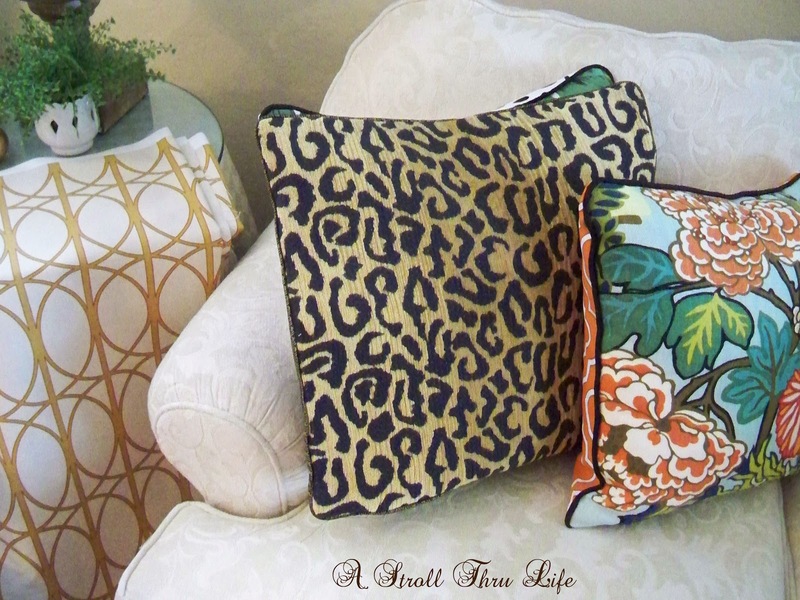 The photo with the brown floral pillow has me swooning!!! 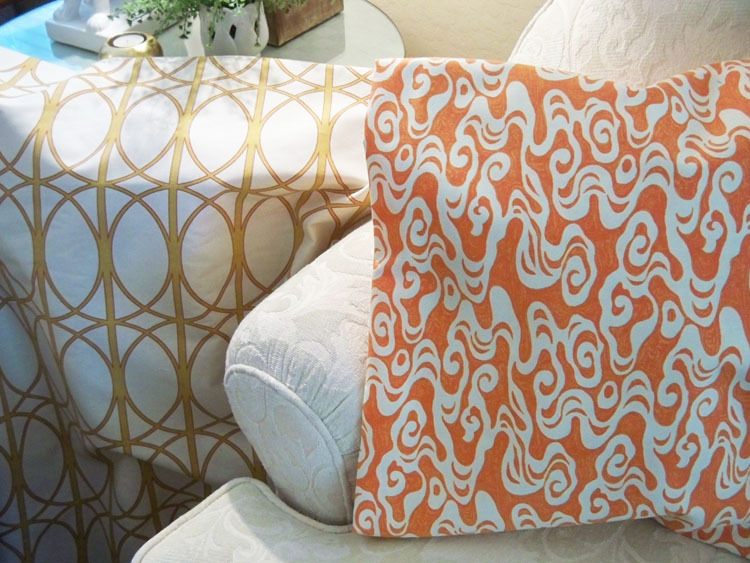 I agree that fabrics are an amazing "jumping off" media!!! I use paper as my artist medium; however many times, my inspiration comes from fabrics!!! I think this table cover fabric choice is marvelous!!! 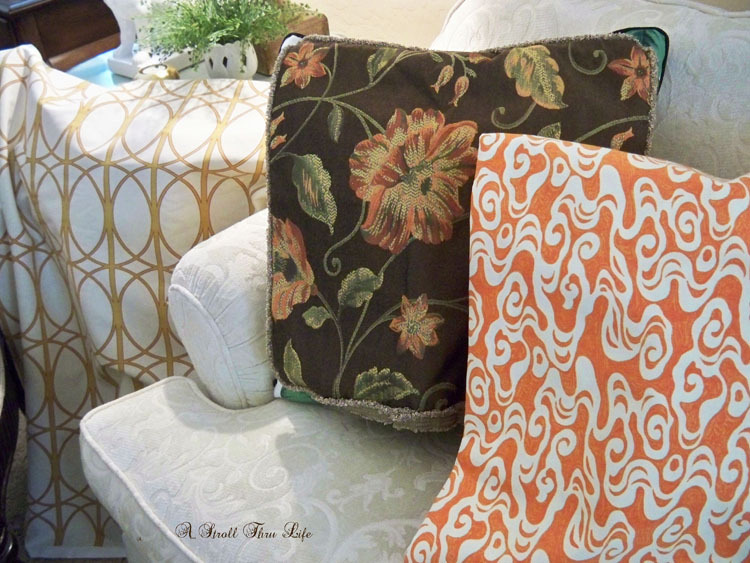 I would love this store as I, too love fabrics! Is it a physical store or an online store? Marty, you have such a good eye for color and what blends. They closed that Fabric store here and I almost cried. I loved it and the prices were excellent. All of my toile drapes were made with fabric from there. The only good place around here is JoAnne's if you have a 40 or 50% coupon. I am always buying fabric and use it later if I really like it. Pretty combinations and colors/patterns you've assembled! All are lovely! Looking forward to the round tablecloth tutorial! Marty, You got some great bargains on the fabric. I love all of it and especially the tablecloth fabric. Love them all Marty and that fabric on the table reminds of those beautiful glass topped metal scrolled tables! I buy fabric the same way and my, I LOVE your latest finds Marty!